alaTest has collected and analyzed 265 reviews of LG 42LF652V. The average rating for this product is 4.5/5, compared to an average rating of 4.6/5 for other products in the same category for all reviews. People really like the image quality and sound. The design and price also get good comments. There are some mixed comments about the reliability, while many are less positive about the energy efficiency and remote control. We analyzed user and expert ratings, product age and more factors. Compared to other products in the same category the LG 42LF652V is awarded an overall alaScore™ of 90/100 = Excellent quality. Excellent picture quality. Simple to use. All the features that you need. Excellent value for money. Haven't tried 3d yet but can't wait to do so. Sound quality isn't that good and we have a sound bar in front if the TV which blocks the remote signal. Picture quality not up to Samsung quality. Excellent picture and sound quality, and good viewing from quite a wide angle. The user manual is a bit basic, although this is offset somewhat by the on-screen instructions. 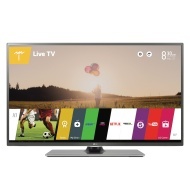 LG 42LF652V 42 Inch Full HD Freeview HD 3D Smart TV. Fabulous TV.. Great price and excellent quality. Very good value for money.
" I am highly delighted with this tv. The picture quality is excellent. I am delighted with the 3d feature. You get two pairs of 3d glasses which are passive so their is no need to replace batteries. "